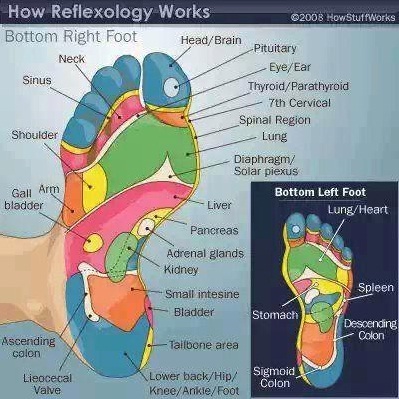 MediMiss Alternative Alternative Therapy Foot Care Foot Pain Arch Foot Reflexology Health healthy tips how to Reflexology Reflexology Chart Reflexology Massage What is Foot Reflexology? Foot Reflexology has become a well respected ADJUNCT to regular medical care.It is used in Hospitals, by Physical Therapists and Chiropractors to enhance MOST forms of medical treatments. In fact, the only thing that is the same is that medical science can't prove how it works...they just know it does!! There are over 7,200 nerve endings at the bottom of each foot. Nerves connectto every organ, every limb and region of the body through the brain and spinal column. It is thought that foot reflexology works in much the same way. Even though we don't actually work the nerve endings, the correlation of the bottom of the feet to every region of the body definitely exists. It was originally called "The Zone" therapy in the early 20th century and was successfully organized into a comprehensive therapy by a physical therapist, Eunice Ingham in the '40s. She coined the term "reflexes" when referring to this therapy. Learn to do foot reflexology to help your family and friends feel better! Get helpgetting your body back to its' natural state of health by teaching your family todo foot reflexology on you! Please, if being treated by a medical professional, get that professional's permission before doing foot reflexology for that medical condition.